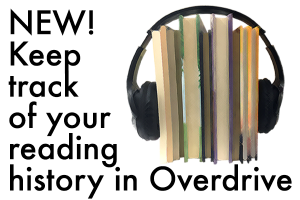 We are happy to report that the Reading History feature is now live on our OverDrive site. Each time a title is borrowed, it is added to the user’s history. At launch, a user will see an empty history until they borrow a title, or manually add it. Titles can be manually added through the context menu (…) or from the title details page. For example, users can add titles they read before the start of the history, or titles read from other sources (print, purchased, etc.). Users can remove individual titles from the History page through the context menu (…) or on the title details page. Have fun and spread the word. Find out more on the Overdrive site. Visit the ebook & audiobook page at ValleyLibrary.ca, and login with your library card number and PIN, to get started!